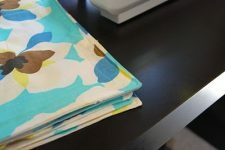 Like I mentioned in this post, I had some left over chalkboard paint from when I did Penelope’s playroom makeover. And now I wander around my house, mentally referring to my chalkboard pin board on Pinterest, trying to find things I can paint with chalkboard paint. One Fall, several years ago, I thought it would be a great idea to buy 5 million clay pots and put mums inside and line them up and down my front steps. It was beautiful, but not very practical. Ever since, I have had mountains of these clay pots in my garage, just waiting for the perfect DIY to come along. 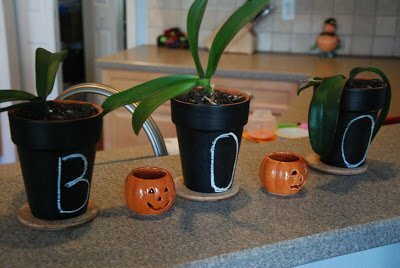 I had been meaning to rearrange and re pot some of my orchids and replenishe their soil with some orchid fertilizer. 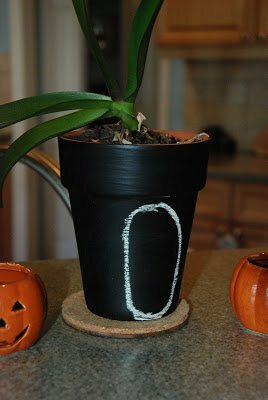 I slapped some chalk board paint on the pots first before I replanted. I painted two coats. Then I wrote Boo in white chalk. I love how it came out! So stinking cute and best of all, EASY. I have seen all kinds of footprint artwork on Pinterest, but I haven’t seen this till my friend did it. She made hers out of felt and put it on a felt, trick or trick bag she made for her daughter. I was going to do this painted version, but my other friend beat me to it. 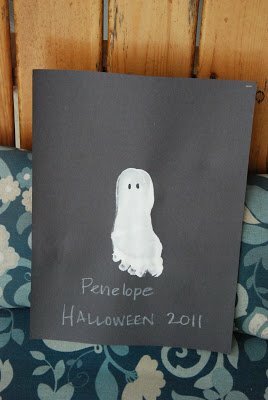 She watched Penelope for me the other day and they did this craft together. I think this would look super cute in a black frame with a white background. It would be cute to do this every year and make it a tradition. 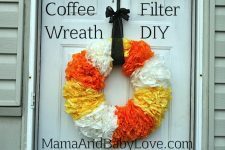 And lastly, another super easy, toddler craft that doubles as a Fall decoration. Again, this is not my idea but one of my friends. 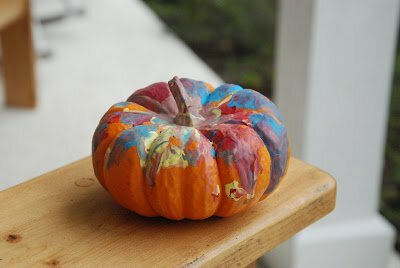 Penelope had so much fun doing this, she says Paint Pumpkin!, several times a day. It is just plain old acrylic paint and let your little one go to town. Oh and P.S. remember this post with my Candy Corn pins? Yeah, well, I was right, I ended up eating the entire glass jar of candy corns. I actually pulled it off the counter and sat down with the damn thing on my lap and watched a movie. No more decorating with candy corn for me. 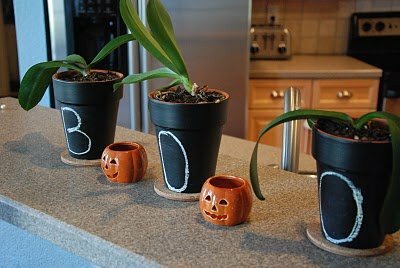 What is your best and EASY Halloween decoration? A friend of mine cut out black construction paper rats and put them up her stairs…so it makes this neat shadow looking thing with all these rats everywhere…super cheap and very easy! Hey Stephanie! I am a faithful blog reader and I love that youare as addicted to pinterest as I am! My pinterest name is KateLeo and I follow you on there too. Looking forward to seeing more posts on your pins!